Registration from 10.00am – Start at 11.00am. Children under 16 free. 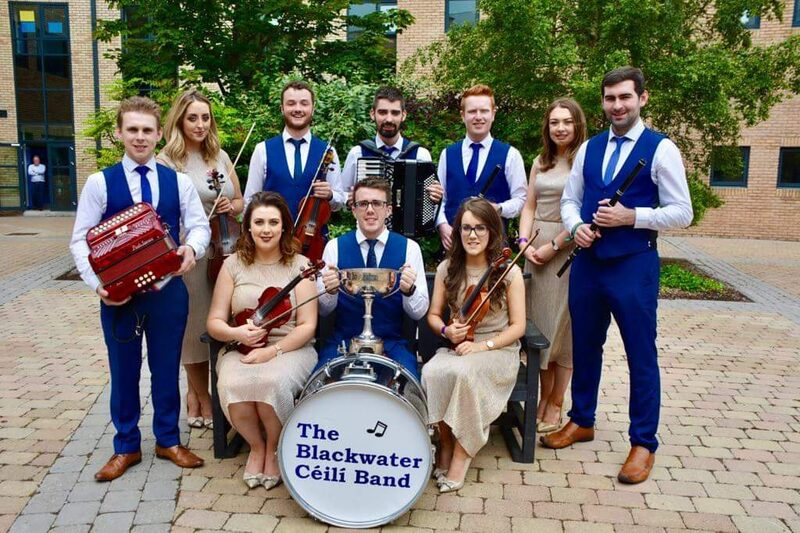 The Blackwater Céilí Band hails from the Clogher Valley area of County Tyrone and gets its name from the River Blackwater, which flows through the heart of the region. The band was formed in 2015 and consists of musicians from Tyrone, Monaghan, Down and Leitrim. They have become a well known band in the area and further afield over the last few years, playing at concerts, fleadhanna and céilís. The band has competed at All Ireland level over the last 3 years, culminating in a joint 2nd placing at Fleadh Cheoil na hÉireann 2017 in Ennis. The band strives to produce a traditional yet lively style of céilí band music and we are delighted to be performing at this year’s Brantry Fleadh. Members are Ryan Hackett (band leader & piano box), Michael Curran (button accordion), George McAdam (drums), Mark McCrystall (piano), James McCaffrey (flute), Michael Coney (flute), Rosie Ferguson (fiddle), Lydia Warnock (fiddle), Ursula McAdam (fiddle) and Eugene McKenna (fiddle).